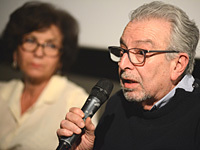 Despite the fact that Middle East, What Cinema Can Do opened its doors one week after the tragic events of November 13, 2015, which resulted in 130 people killed in the streets of Paris, the festival noted a record-breaking attendance. It was stated in the press all over the world that the Parisians were resistant, resilient and would not be deterred from their cultural life in the cosmopolitan capital; our 7th edition welcomed its largest crowd ever. This success can be attributed to attendee inquisitiveness and searching for answers to the raging issues in the Middle East and the increasing number of young people brought into the venue thanks to social media. Debates following the films each evening addressing topics such as the chaos in Libya, the origins of ISIS in Iraq and the large number of migrants in movement into Europe from the Middle East and Africa were truly pertinent. Expected filmmakers from Israel, Iran, Palestine, Cyprus, Lebanon, Italy and Belgium all sent their support and never hesitated to attend the screening of their film and dialogue with those present, as well as participate in television and radio interviews promoting the biennial. Past editions have coincided with other historical events: the March-April 2003 biennial was preceded by Mahmoud Abbas' appointment as Prime Minister of the Palestine National Authority, and the Roadmap to peace initiative under George W Bush, who spoke of the two-state solution. At the opening of this biennial, when it was still called Israelis, Palestinians: What Can Cinema Do?, the invasion in Iraq got underway and the start of the Iraqi war. By 2005, Palestine was moving out of its 2nd intifada. Our 2009 edition looked back at the invasion of the Israelis against the Hamas in the Gaza Strip - Operation Cast Lead, in which close to a thousand civilians were killed. From what was a clear focus on Israel and Palestine then shifted, becoming clearly a Middle East problem spreading: Iran, Iraq, Syria, Lebanon, Egypt and Libya. And so we changed the name of the biennial to Middle East: What Cinema Can Do, in the affirmative form. Stephane Hessel, a regular participant from the early days of the festival, attended our event for the last time in December 2011, as he passed early in the year leading up to our 5th edition in November 2013. His final "appearance" in 2011 lasted 45 minutes, alone before the audience and was stunning, captivating the audience with his stories and convictions, answering questions and notably reciting selected poems from his repertoire. A very memorable moment! Memorable year indeed, the revolution "Arab Spring" began spreading throughout the Arab nations uniting the youth in demonstration as was pictured on the cover of our catalogue. Moreover, on December 13, 2011, the last day of our 5th edition, UNESCO raised the Palestinian flag at its headquarters. Palestine had finally acquired recognition as a country in an international organization and the following year became a non-member observer state in the United Nations. The 2015 cru of films was once again dominated by documentaries, and was notable for the large number of women both in front and behind the camera, sharing a more intimate view of their world, one quite different from their male colleagues. We presented two feature films making their Parisian premieres, both by Palestinian filmmakers. In addition to a solid film and debate program, there was the added attraction of a very interesting presentation of the Israeli-Palestinian conflict as depicted in cinema, given by François Dubuisson from Belgium Open University. What will be the state of this region in two years? To be seen, but we hope to see you back at the 8th edition of Middle East: What Cinema Can Do in November 2017 to explore further the issues at that time.